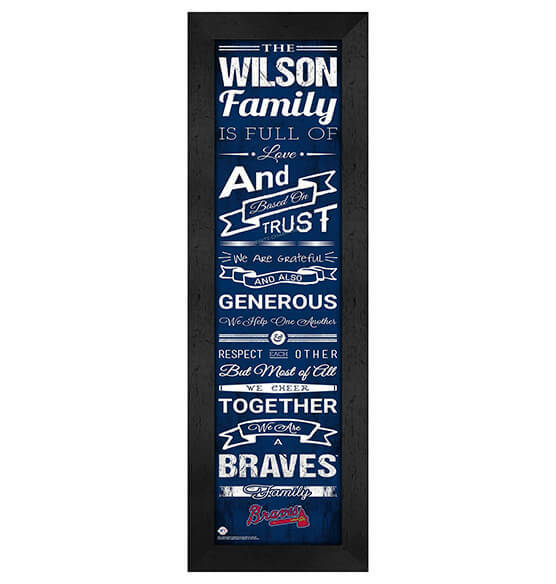 With Atlanta Braves Baseball Personalized "Family" Wall Art decor, you can help celebrate life's memories. Personalized Family Cheer's high-quality custom Major League Baseball (MLB) wall art combines your love for the Atlanta Braves with your commitment to family into one spectacular gift that will be cherished forever. Featuring MDF vinyl-wrapped frames, paper and glass, our personalized baseball gifts sport vibrant team colors and heartwarming phrases that capture a family's love and devotion to each other — and to America's Team! Ideal to give as a gift, buy for yourself or offer to a family who loves the Atlanta Braves. This thoughtful gift is one that will be remembered.